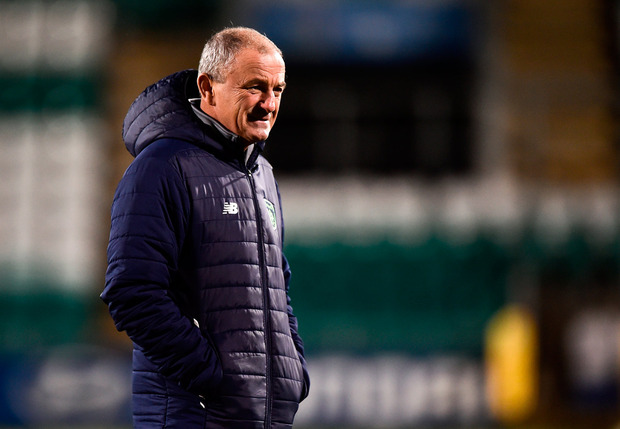 The non-committal answer given by John Delaney in Belfast last Thursday confirmed that the clock was ticking down on Noel King's time as Ireland U-21 manager. Official confirmation was delivered yesterday with King 'retiring' from the role after eight years to concentrate fully on his brief in the area of scouting potential recruits - or Player Identification Manager in FAI speak. King had already been working in that area in tandem with that brief and that was one of the criticisms aimed at the Dubliner over the past year with his squad peppered with individuals born outside of the island. With qualifying hopes all but gone, Coventry player Jordan Shipley was parachuted in for the final double-header even though he will be too old for the next campaign. It was a curious call. King was regarded as quite loyal to his players, wherever they came from, but his exit presents the opportunity for the FAI to freshen up a department which sat a bit out of sync with the U-17 and U-19 squads. Members of Colin O'Brien's U-17 team have smoothly transitioned to Tom Mohan's U-19 squad and the hope now is that the link to U-21 level can be equally fluid. The level has tended to sit apart and King has tended to favour individuals getting opportunities at first team level in England - even if they are in the lower reaches of the Football League. A criticism is that later developers, some of whom are based at home, missed out on games that might have helped them along the way. Then again, King also knew that results were being used to judge him and would argue the last campaign was going very well until he lost Declan Rice's services. It is a difficult job as any outstanding players that emerge are likely to be bumped up to the senior squad. Ireland have never really been serious contenders to qualify for tournaments but the bid to bring the 2023 Euros to this island could function as a focus in this age group. The FAI say that the process of identifying King's replacement "will begin in due course". High-profile former internationals Robbie Keane and Damien Duff are two names that have been strongly mentioned in dispatches. Keane is out of the work at the moment, while Duff is working with the U-15 side at Shamrock Rovers. There are suggestions that they would work alongside a head coach, and a straightforward option could be to bump Mohan up from the U-19 squad. The downside to that plan is that the U-17 and U-19 team have already started to build towards next year's Euros. O'Brien's U-17 team are hosting the finals in May and do not have to qualify; they are playing a mini tournament across the next week to assess their options with England the guests in Tallaght tonight. Mohan's group have made it through to the Elite Phase at U-19 level so bumping managers up the chain might upset the apple cart. The ambitious call would be to target former Ireland midfielder Lee Carsley who is a highly regarded member of the England set-up where he is a coach with the U-21 team. Indeed, he has been touted as a candidate to progress to a backroom role with the senior team and might now be out of the Abbotstown hierarchy's reach. Carsley had previously expressed an interest in working with the FAI, but no firm offer was forthcoming. Steven Reid - who recently left his role as assistant to Roy Hodgson at Crystal Palace due to personal factors - is another prospective option. FAI high performance director Ruud Dokter has a role to play in the appointment. With experienced coaches - Don Givens and King - holding the berth since 2000 then it's time to try something different. It should also be a level for developing coaching candidates for the senior side.